S.H.O.O.T. 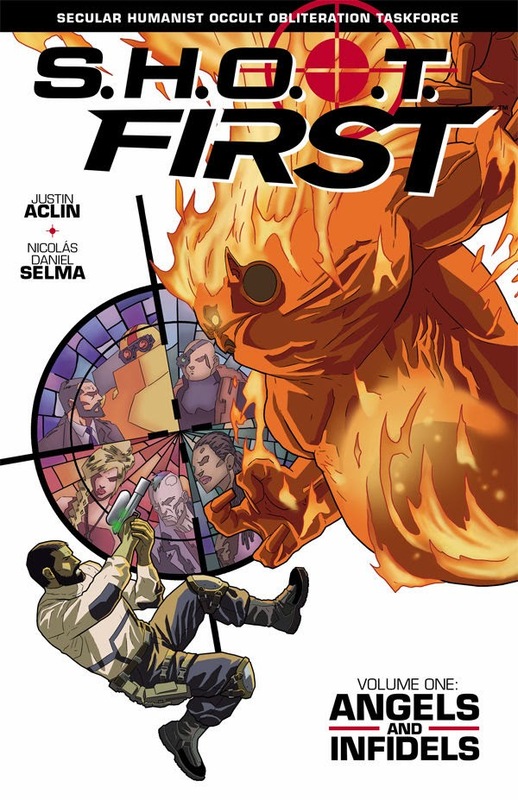 First, my comic with co-creator/artist Nicolas Daniel Selma, colorist Marlac and letterer Amanda Aguilar Selma, is out today in collected form in book stores. That means that for those of you who wanted to read it but didn’t feel capable of navigating the arcane mysteries of ordering from comic shops (Hi, mom! ), this is your chance. You may be able to find it in book stores, but I have no idea how widely it was ordered so I’d definitely call ahead first. If you’ve read and enjoyed the book, please consider reviewing it on Amazon or Good Reads. I always hear that it makes a huge difference, so I really appreciate if you’re able to. I’ve mentioned before that this book is really important to me. Not only does it represent an amazing amount of work and skill by my collaborators and my amazing editors at Dark Horse (the incomparable Dave Marshall, Aaron Walker and Ian Tucker), but it means a lot to me personally. As you know if you’ve been reading my author’s notes on the blog, I put a lot of myself on the pages. Real talk: it’s not easy to be a published comic book author, and you often hear that staying in is even more difficult than breaking in. I’ve been tremendously fortunate to have been able to publish several books - enough, in fact, to fill a “More Dark Horse books by Justin Aclin” page in the back of the S.H.O.O.T. First TPB, which is staggering. And sometimes, in my least optimistic moments, I wonder if I’ll ever get to publish anything again. But having held this book in my hands, I know that even if I never get published again (and at my most optimistic moments, I say, “Of course I will!”), I’ve put something out in the world that means something to me. Something that might even be able to mean something to other people that read it. And I count myself among the luckiest people in the world to be able to say that, and I have nothing but immense gratitude for all the people who helped make it happen, and especially to the people who put something of themselves in this book, too.